Founded in 1131 by Water de Clare, Tintern was to become the wealthiest abbey in Wales, owning many estates. The monastic buildings were not completed until the 1340s. After the house was dissolved in the 16th century, the abbey fell into disrepair and gradually became the romantic ruin so admired by 18th-century travellers. 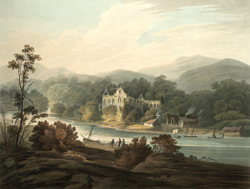 The picturesque appearance of the ruins was enhanced by their location in a wooded valley near the meandering River Wye. William Coxe noted: "a pleasing intermixture of wildness and culture, and temper the gloom of monastic solitude with the beauties of nature."